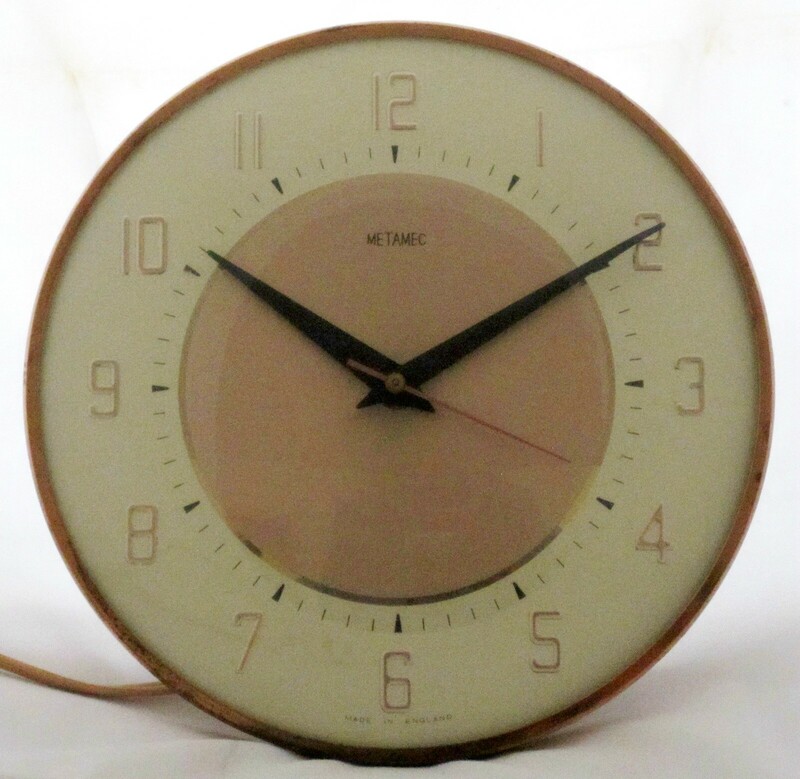 Metamec, based in Dereham, Norfolk, England, started making synchronous electric clocks in 1947. 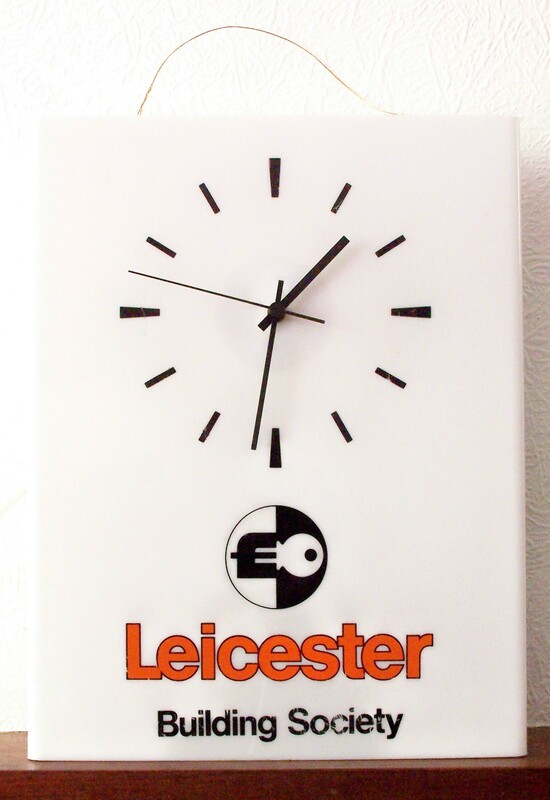 They stopped making clocks when the company went into receivership in 1984. Some Metamec synchronous clocks have a synthetic tick which can be turned on and off. For further information, and the history of the company, see BIRD C. Metamec. The clockmaker. Dereham. Wadhurst, Sussex: Antiquarian Horological Society, 2003. The book includes extensive information on individual models, including a picture gallery. Metamec also made mechanical clocks. POOK L P. British domestic synchronous clocks 1930-1980, Springer, 2015. Model designations in the list, and in descriptions, are from Bird’s book, as are production dates. I am trying to locate the place where i could get an electric alarm clock of Metamec,I bought mine years ago from John Lewis London,thank you for your kind cooperation. Since Metamec stopped making synchronous electric clocks in the 1980s the only souce is the second hand market. They are regularly advertised on eBay, but descriptions need to be read carefully to ensure that a clock is in good working order. I have a metamec clock that is encased within a three masted wooden ship. It has three masts with chrome sails togther with a bow sail and jib. The fore and aft chrome cabins contain pygmy bulb lamps. Was this a standard model and do you think it would be worth restoring? This is a special, which would have been made in small quantities. It is not mentioned in Clifford Bird’s book on Metamec clocks. 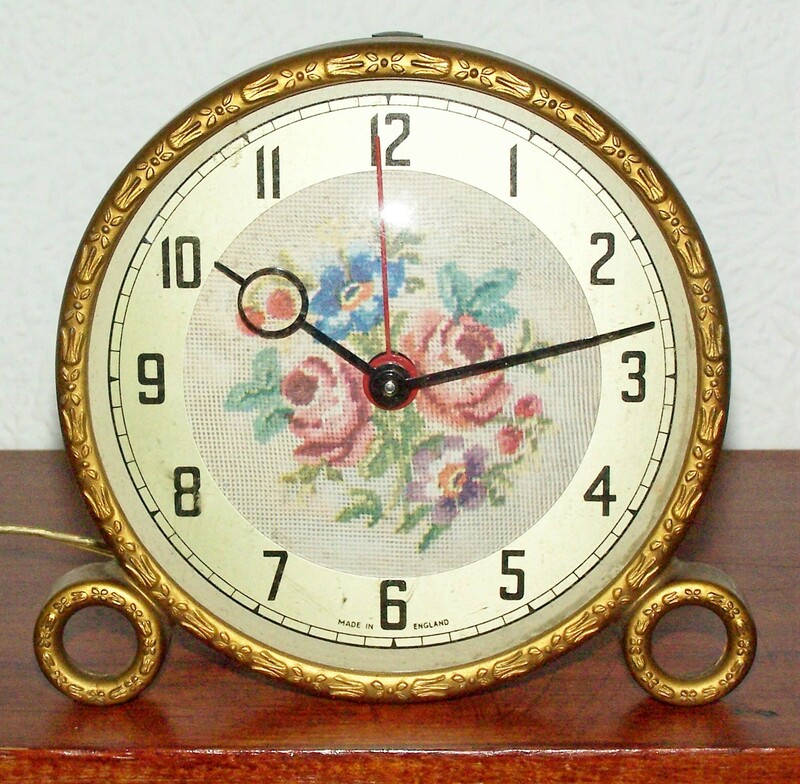 The clock is a collector’s item that is worth restoring, especially if you intend to keep it. I have a wooden mantle Metamec model 727 clock from I believe 1956 or at least the 1950’s. I’m trying to find its value. If anyone knows please let me know this web site. Thank You, L.M. I purchased a old metamec clock at a yard sale years ago, it’s a small mantel clock but is not electric, it is a wind up. The small hand has a large circle near the end of it. I am looking for a way to get more info on it. The best general source of information on Metamec wind up clocks is Clifford Bird’s book, cited above. Metamec sometimes fitted the same type of case with both mechanical wind up and synchronous movements. I have updated the Metamec page to reflect this. I had a great fright at 2.00a.m when, as it turned out, a T2RV Metamec Electronic Security Control switch went BANG! Thankfully, it tripped my fuse box and after resetting it and the RCD switch all my electrical sockets were OK. What a scare. Going by this site, the device must be some 30 years old so I guess it is an end of life thing. But, has anyone else experienced that? Metamec was bought from receivers by FKI a Yorkshire based company in 1984, when a management buyout failed at that time to purchase the company – and became FKI Metamec – still based in E Dereham. There was a subsequent buyout from FKI in the late 1980’s (1989?) by the then management. i have a metamec electric clock that works perfectly except the glass was broken in it, where could i get a replacement, its got a black face with a gold band around the face where the numbers are, its set in what looks like mother of pear but its probably plastic of some sortm with a gold trim and the over all shape is approx eight inches by five or so! Replacement clock glasses are available from horological suppliers, but can be tricky to fit. I usually buy from http://www.cousinsuk.com. I have no other connection with Cousins. Model 944 production from 1967 to Jul-71. 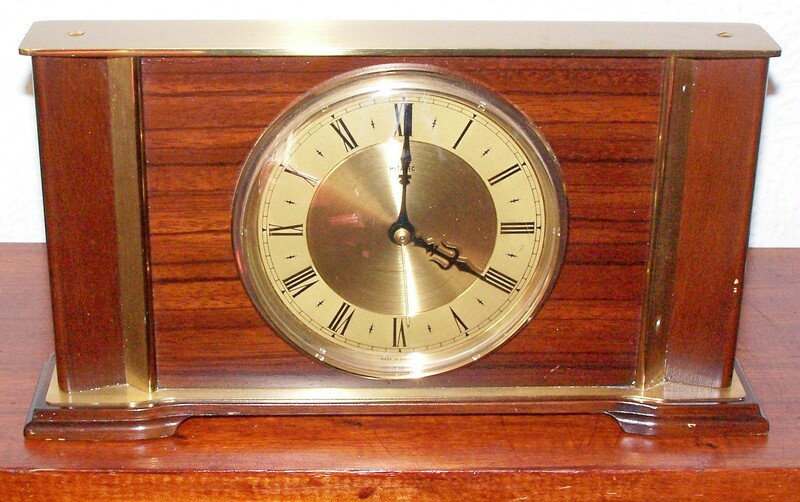 I have this exact clock which I aquired at an auction for $5.00 Australian money & am very curious as to its true value . It still works but has a slight mark on front of it . Can you please help me . Thanks for your comment, enjoy your clock. It is impossible to place a value on it since prices achieved at auction vary widely depending on how many people are interested in a particular clock, and how badly they want it. Mr Pook thank you for your blog. I have a Metamec wind-up mantle clock that is not pictured here. It has 1/3/2676 scratched onto the back but this has not helped me so far in my search. After taking it to a clock repairer he advises that I need a whole new movement if it is to return to being a working 8-day clock. Can you pls advise where I can start to look for the right movement as of course the manufacturers no longer have a web site. Many thanks, Jane. The repairer is correct. Mechanical movements are available from horological suppliers such as Cousins: https://www.cousinsuk.com and Walsh: http://www.hswalsh.com but it might not be possible to find a movement that is easy to fit. Alternatives are to fit a quartz movement or a synchronous movement, available from horological suppliers. Unfortunately, spares for Metamec clocks are not generally available so there is no easy solution. Used parts are occasionally listed on eBay and elsewhere. It might be possible to repair the clock but professional repairers would be reluctant to do this. Hi. I have a model s-170 Metamec clock, fitted with an electric movement. I just wondered its approximate age? Metamec synchronous electric clocks are designed to connect to the mains (240 V, 50 Hz) so no transformer is needed. Some people convert clocks to quartz when the synchronous movement stops working, although I regard this as regrettable. So how would I connect it up to test? Just by using a mains lead with the thin cables like you use (or used to use!) for chrismas tree lights? What AMP fuse would I put in? 1A? Use modern double insulated twin core wire. I use flat 0.5 sq mm which fits through holes in movement covers. It is available from electrical suppliers, and in short lengths drom Homebase. With this wire a 3 A fuse is appropriate. Not a reply but hopefully an interesting question: I too like electric clocks, but when I see that the female lead is not present with a clock, I don’t buy it. I see this a lot and wonder why on earth this happens. Does anyone know how to make the female part – the part that continues with the length of flex and then the plug for Smiths, Temco, Metamec clocks and are they all a standard fit? The connectors used by Temco, and by some other manufacturers, are what used to be British Standard 2 pin 2 A connectors. These are now obsolete so new female connectors are not available. The best alternative I have found are the 4 mm banana sockets sold by Maplin: codes N10JN (black) and N09JN (red). Some adjustment of the pins is needed to get a firm fit. This arrangement is safe if used carefully, but I must point out that it does not meet current electrical regulations. Much appreciated and thanks too for the caveat at the end of your message. Also, delighted to see a mantel clock version of the Metamec windmill clock for a child. I have a wall one with the same scene in a red plastic case and the windmill works! Thanks too for the pics of the movement. Also I have a Metamec Petite Point-dial alarm clock like what’s on your website. Mine works intermittently. I’ll be selling it on eBay very soon. I know of one other who has one in their shop in England. Hi, yeah see i have a Metamec, Diehl Type 726 Mantel clock & I was wondering on it’s approximate age, if anyone could help that would be great. Hi Les, I have a Metamec mantle clock (model number 5953) and the brass fitting on the top has a patch where it has become tarnished. Is there a way of cleaning it? Stephen, it depends on whether it is solid brass or brassed steel. If it is solid brass then Brasso should work. If it is brassed steel there is no easy answer. Try gentle rubbing with a soft damp cloth. 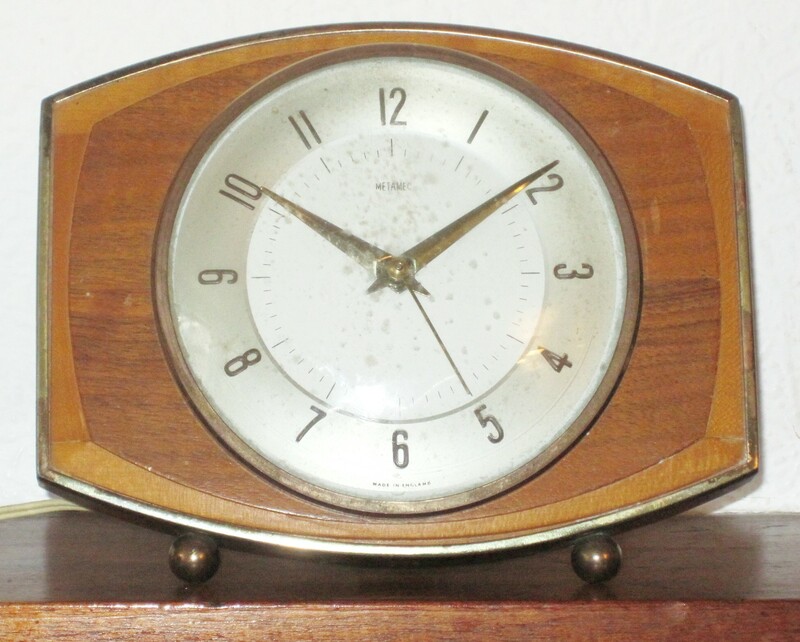 Hi Les, I have recently inherited a fully functional Metamec synchronous motor mantel clock, originally purchased by my parents in 1948 in Birmingham – it’s been keeping good time since as far back as I can remember as a child, and still going! Body is a square block of what seems to be mahogany (? ), with side support feet. No evidence of a model number, except for the numerals “27” stamped on the underside. I’ve searched the web and can find no trace of this design – how can I identify which model it is? The best place to look is Clifford Bird’s book ‘Metamec. The Clockmaker Dereham’, Antiquarian Horological Society, 2003. This includes numerous photographs of Metamec clocks, but not all are illustrated. Hi Les I have a Metamec electric clock still boxed and unopened. Label says 825 White. Looks like a mantel clock from picture. Has it a value? Yes it does. 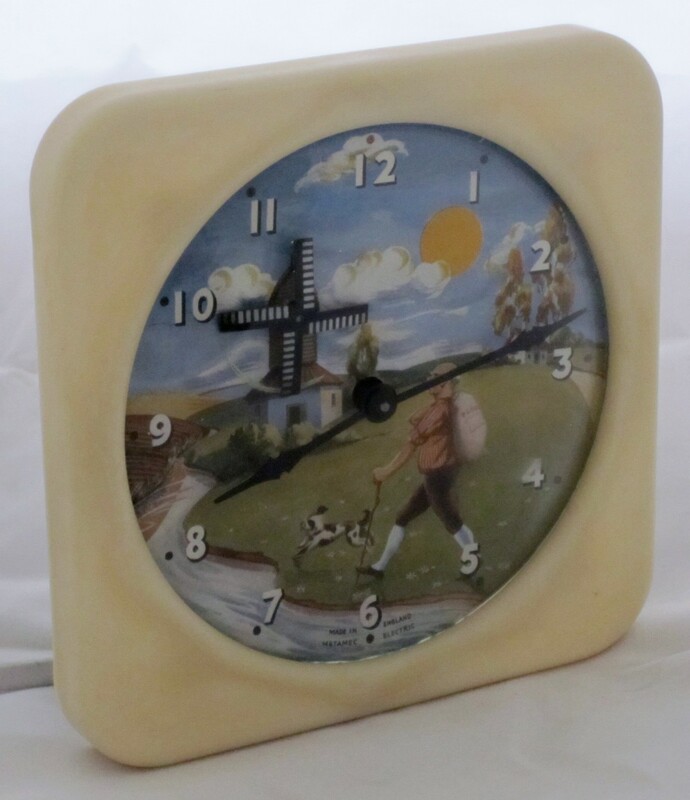 Boxed clocks usually sell on eBay, i suggest looking at eBay to get a guide to an appropriate starting bid. Hi I’m fascinated by these clocks, I have two which I use. Think I’ll probably buy a couple more, my wife thinks I’m mad! I like the battery ones really want the orange one with white numbers. Where can I get hold of the his book everyone seems to be getting there info from? ‘Metamec the Clockmaker Dereham’ is available is available from the Antiquarian Horological Society. Google this. Alternatively try Amazon. 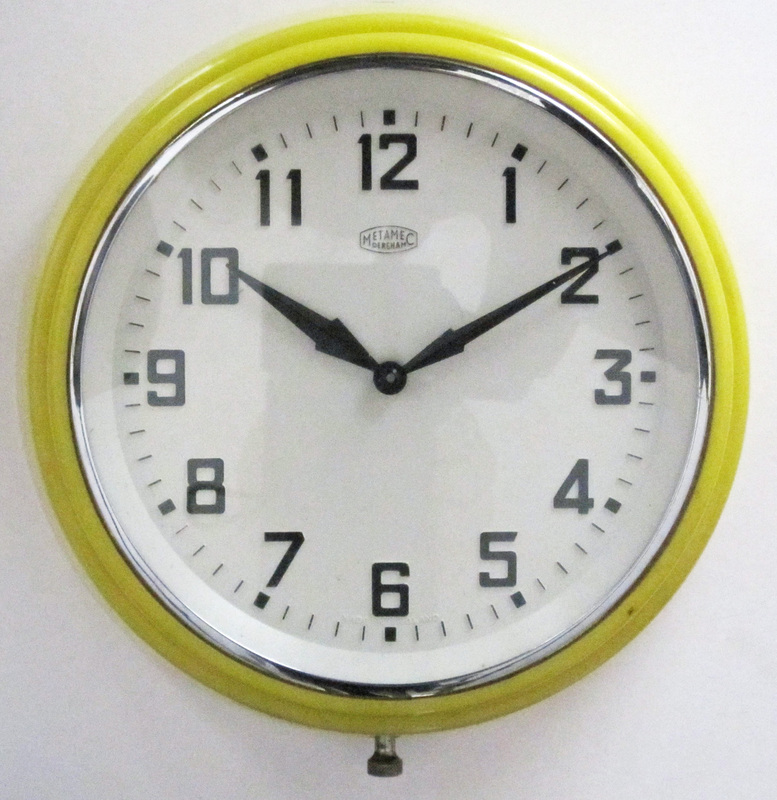 Model 5635 electric wall clock,as your photo. I want to convert this clock with a quartz movement. But I need to remove the glass and chrome ring to get to the hands. Looks like it might twist off but I can’t move it. Is there another way? Don’t want to snap the plastic. Can you help please? The chrome ring (bezel) is held in place by twisted metal tags, visible behind the clock. To remove the bezel and glass straighten the tags so that they will pass through the slots in the plastic. On re-assembly only twist the tags enough to hold the bezel and glass in position. Please don’t discard the synchronous movement. It should sell on eBay as a source of spares. Hi Julia, I have the same problem as I cannot move the bezel or body in different directions? How did you get on? I haven’t succeeded yet! Mine doesn’t have metal tags so at present I’ve given up. Let me know if you work it out please. 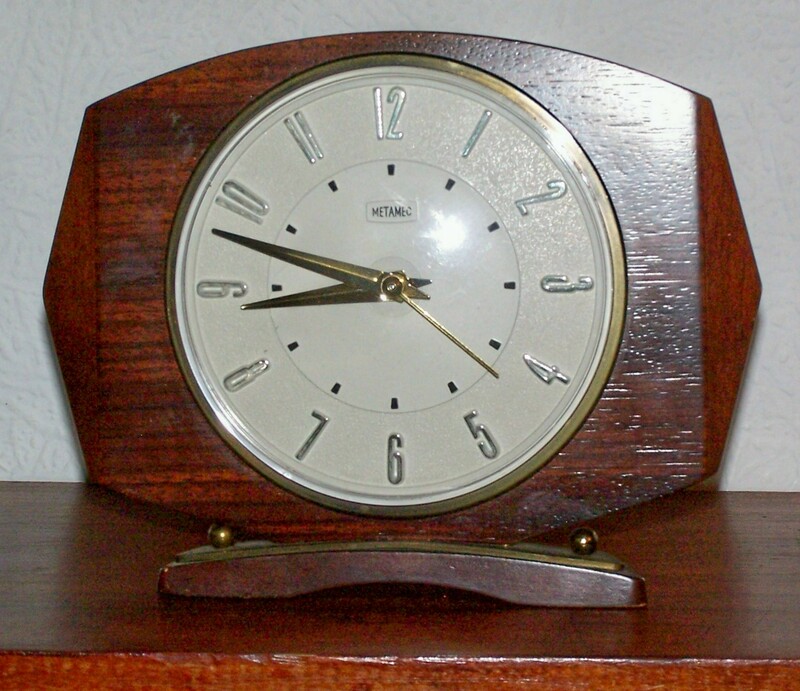 Hi Les, I’m looking at getting a clock that looks identical to your model 5635 electric, but is wind up. Are these also synchronous? Do you know whether they tick, and how long a single wind-up lasts? Thanks very much! Jake, there are no easy answers to your questions. Metamec did make both mechanical and synchronous versions of many of their clocks. They used mechanical movements from various sources. Some were 30 hour and some were 8 day. There is some information in Bird’s book, above. I shall ask the seller, then. Thanks very much anyway, Les. Your answers to previous questions here have helped me, too! I cannot find any information on the said piece , can anybody help please. I have a Metamec Model 724 exactly the same as the one pictured on top of this blog. Seems to work fine in every respect and keep[ accurate time although I can’t adjust the time using the little knob on the back. Is there a special knack to doing this eg: pushing it in or pulling it out while adjusting the time or something else. I don’t want to force anything to try and make the adjustment. I have a model 299 mains electric mantle clock in working order and wondered how old it is. It has Dereham metamec made in England on the face . Metamec stopped making clocks in 1984 so your clock is at least 35 years old. I have no information on the particular model so cannot be more precise.